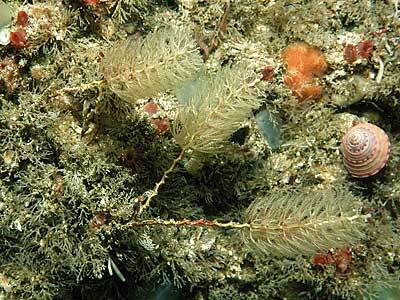 Description: This hydroid consists of a wiry central stem supporting a 'brush' of branching side-branches. The side branches are all of the same length and branched a few times, giving the appearance of a bottle-brush. Habitat: A typical species of shallow and deep, exposed rocky sublittoral habitats. Distribution: Very much a northern species in the British Isles, this species is only found around the north of Scotland and down into the North Sea. On the west coast it extends south only as far as the northern end of the Outer Hebrides, but it occurs as far south as Northumberland on the east coast. Similar Species: Unlikely to be confused with any other hydroid, much more robust than Sertularia argentea. Picton, B.E. & Morrow, C.C. (2016). Thuiaria thuja (Linnaeus, 1758). [In] Encyclopedia of Marine Life of Britain and Ireland.